All Briggs & Little yarns come in 4 oz. Skeins except Softspun lite N fancy, and country roving. NOTE: Shipping is additional and will be charged separately unless you email me first for a custom invoice! We can send you a PayPal money request with the correct amount for yarn & shipping if you email us with your order information. We can only place special orders when we have approximately 7 pounds on order. If you need less yarn, we can include your requests when there is enough yarn to place an order. Email me for more details. I can also post on the Weaving Rainbow Facebook pages here and on yahoogroup lists when I know I can place an order. The batts are priced differently, please email me for more information. Country Roving has its own page. This yarn is suitable for: Knitting sweaters, vests, socks, mittens, gloves, scarves, hats, afghans or pillow cases Weaving blankets, coating or upholstery material. 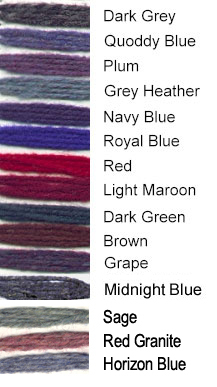 This is also a popular yarn for tapestry weaving and comes in several beautiful shades.